So, a crazy woman bought out PacSun store’s ‘indecent’ T-shirts in Orem, Utah this week. Since I live in Utah, this sort of embarrassment is appalling to me and I wanted to see exactly HOW indecent they were. I went to the PacSun website. They weren’t indecent, but that’s another story. I wanted to buy some clothes from them just in a sort of counter-protest to the crazy Utah woman, but they don’t sell any in my size right now. But that’s yet another story. Today’s story is about this tshirt that I found while looking for the “indecent” ones. 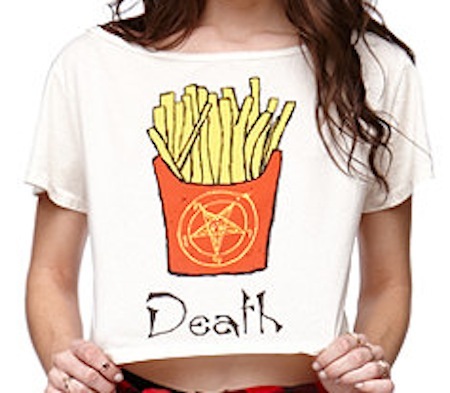 It just shows a drawing of french fries with the word, “death” under it. Is it true? Does every fast food restaurant serve Death Fries with that? Part of me railed against the idea. It’s an over-simplification that just perpetuates the idea of “good” food and “bad” food. It makes the french fries feel forbidden and makes them a tad more appealing in the process. A serving of french fries every once and a while will not kill you. Our bodies are extremely adaptive and can recover from the greasy, salty and starchy combination. Then again, for me, french fries DO represent death in some respects. I only eat them when I’m in the middle of a binge. I only crave them when I am feeling emotionally damaged and slightly suicidal. So, are they Death Fries? For me, yes.